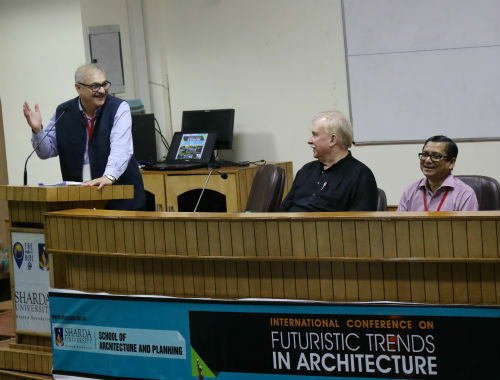 Greater Noida: The 3-day international conference on ‘Futuristic Trends in Architecture’ organised by Sharda University’s School of Architecture and Planning in Education Park III is a treasure trove of professional insights combined with experiential wisdom. Organised in Greater Noida, the inaugural sessions at the conference saw eminent architects and academicians from across the country share their views on the best practices, new techniques and futuristic trends that have made their presence felt in the architectural domain. The event began with the welcome address of Dean SAP Dr. Shovan K. Saha, who thanked the eminent speakers for their presence. The gathering comprised of renowned architects from all over the country, freely interacting with young students. Following the welcome address, Head of the department SAP, Prof. S.N. Segal delivered the introductory note for the conference. Prof. Chetan Vaidya, Director of School of Planning & Architecture (SPA), Delhi delivered the inaugural address. The issue of sustainable architecture was intensely discussed and Pro Vice Chancellor of Sharda University Prof. Ranjit Goswami, enlightened the gathering with his vision on the subject. Prof. Chetan Vaidya kick started the technical session, which was followed by one of India’s most acclaimed architect and urban planner Prof. Christopher C Benninger’s session on the main topic, ‘Vision of the World.’ The session covered climate change, resource constraints, insecurity concerns, affinity for traditions, mechanization of skills & processes, and above all, every architect’s inherent dream to be viewed as master creator. Prof. Manoj Mathur, Head of the Architecture Dept. at SPA, New Delhi, discussed at length on the subject of ‘Critical Determinants of Futuristic Architecture and their Management’. 7 research papers on the subject were presented during the afternoon session, guided by Prof. Desh Bandhu’s able moderation. Great anticipation preceded the following session as renowned American-Indian architect Christopher Benninger, who travelled to India in his late 20s almost four and a half decades back, and has been here since, conducted a one-hour session where he shared his experiences about architectural typology and aesthetic features. He highlighted the advantages of using Indian elements and vocabulary; using exposed bricks, exposed concrete, central space, chimneys that can cool the internal space, skylights, teak wood, courtyard, jails that could help in connecting with the environment along with the use of traditional materials and craftsmanship. With the first day of the conference coming to an end, students and other participants were looking forward to further enrich their knowledge about the various dimensions of architecture. The second day also promises to be full of engaging discussions on interesting topics. Ar. Snehanshu Mukherjee, an eminent practicing architect will conduct a one-hour session on the theme ‘Response to Contextual Dynamics’ followed by a session on ‘Construction Technology and Management, by Dr. Prof. V.K. Paul , Head of the BEPM Dept. at SPA, New Delhi,. The technical session will be followed by presentation of 7 more research papers by professionals and academicians on these subjects and discussion, moderated by Prof. Shhilpi Sinha.